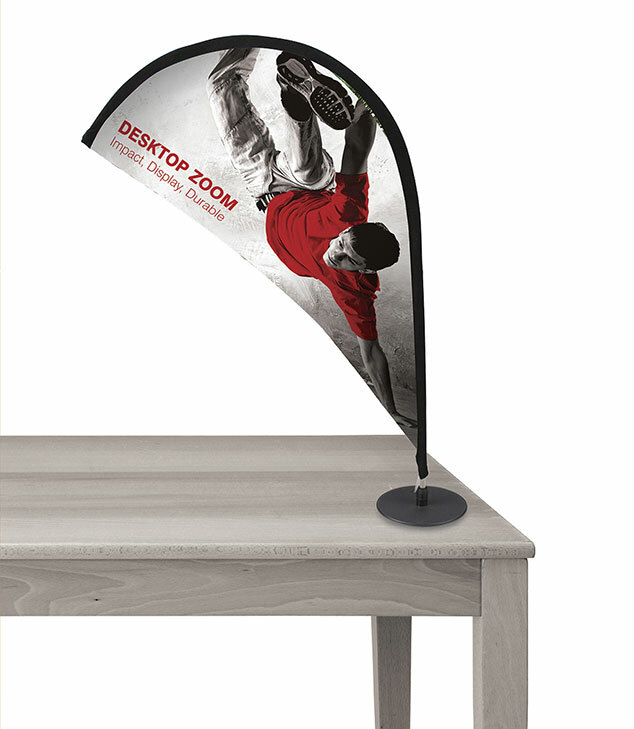 A striking lightweight desktop flag. Ideal if you’re looking for an original identification and branding vehicle. Desktop Senator features a low profile top and bottom rail that is invisible from the front, giving a seamless graphic appearance. 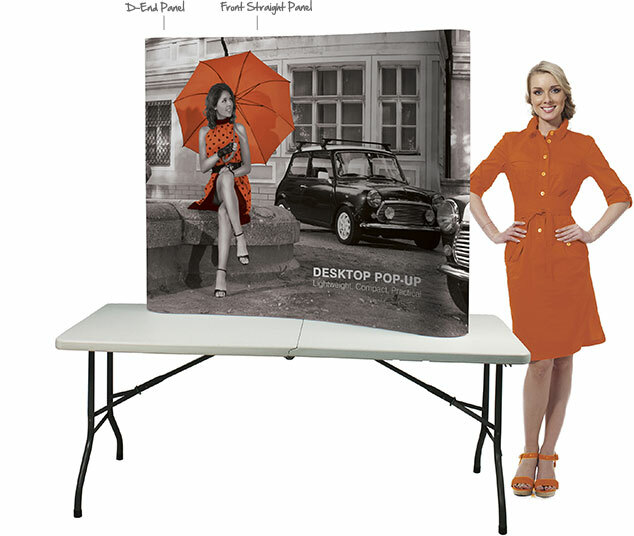 The Quick Mini Pop-up display system combines strength, reliability and style. It is lightweight and easy to assemble thanks to its “Rare Earth Neo Magnets”. 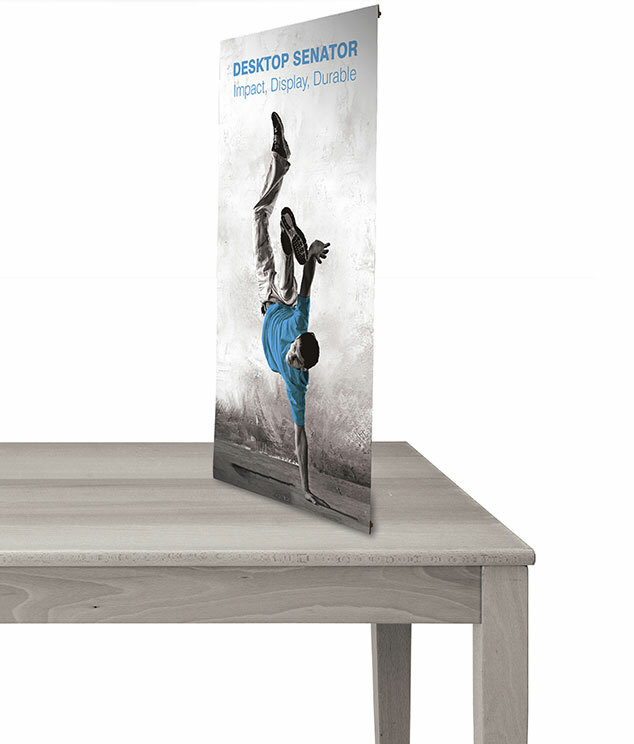 Its small size makes it an ideal backdrop for table and counter displays. 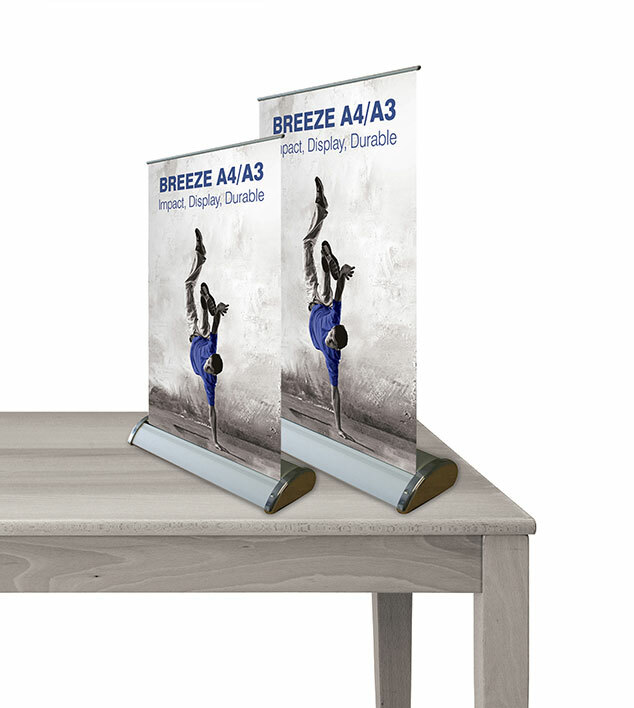 With A4 and A3 sizes available, this is a great and unique desktop promoter. It could even be used as a promotional giveaway. To supply print ready files please set your artwork up to the visual graphic dimensions and then add 100mm to right edge, 10mm bleed to all edges and crop marks. Supply the file to us as a hi-res pdf with all fonts embedded or outlined and the colours set to CMYK. Images need to be 72dpi minimum in the artwork when at 100% size to ensure the best quality images are printed. To supply print ready files please set your artwork up to the visual graphic dimensions and then add 10mm top and bottom, 10mm bleed to all edges and crop marks. Supply the file to us as a hi-res pdf with all fonts embedded or outlined and the colours set to CMYK. Images need to be 72dpi minimum in the artwork when at 100% size to ensure the best quality images are printed. To supply print ready files please set your artwork up to the graphic panel dimensions and then add 10mm bleed to all edges and crop marks. Supply the file to us as a hi-res pdf with all fonts embedded or outlined and the colours set to CMYK. Images need to be 72dpi minimum in the artwork when at 100% size to ensure the best quality images are printed. Please remember to add 150mm to the bottom of your visual graphic area in your artwork. This is for the non-visible area in the roller banner mechanism. 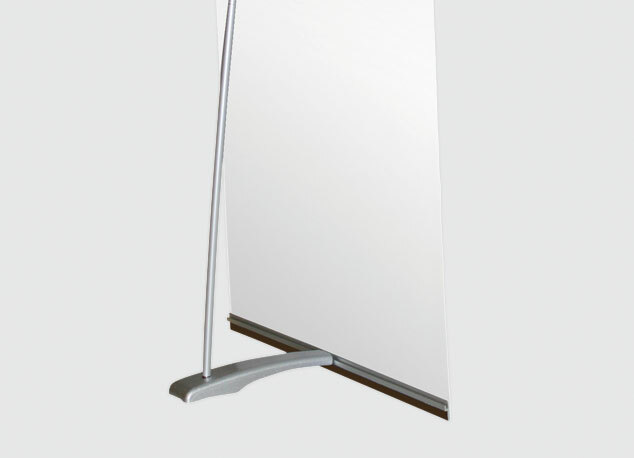 This 150mm area attaches your graphic to the mechanism. To supply print ready files please set your artwork up to the visual graphic area and then add 150mm clear area to the bottom, 10mm bleed to all edges and crop marks. Supply the file to us as a hi-res pdf with all fonts embedded or outlined and the colours set to CMYK. Images need to be 72dpi minimum in the artwork when at 100% size to ensure the best quality images are printed.